"When you see the tape, and the fear, and the reality of what could have happened, it kind of hits home more now"
Charles and Justin Bilton, a father and son from Massachusetts, narrowly escaped a rapidly growing forest fire that started to surround them in Montana last week. Charles Bilton says he realizes now how much danger they were in, but at the time, he was simply focused on getting out of the fire. "That kind of came up on us real quick," Charles said Monday night in Rowley. "As it intensified, it really spread." The Biltons were in Glacier National Park last week when an overnight storm caused several wildfires to spread. "That's what surprised me the most, how fast that thing moved, because out there, it is so dry," Charles said. 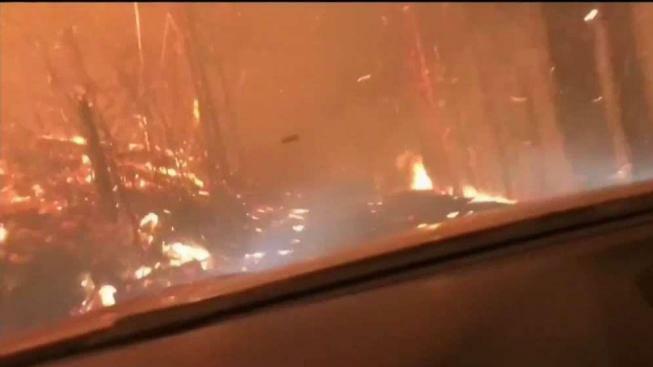 In dramatic cellphone video, you can see, and hear, the father and son start driving their rental car toward the fire in a bid to escape. "Oh Jesus, God help us," you can hear Justin say at one point. "We are thinking we got to get out of here," Charles said Monday. "This is going to get pretty scary, pretty fast." "You can see the flames, and we're driving right into the heart of it," he added. "We get to where it is real intense, fire on both sides, almost made a canopy over us, and it made a glow, and the thickness, and you couldn't really see well." After coming up on a fallen, burning tree blocking the road, the two put their rental car in reverse and drove about half a mile until they were able to turn around and drive away. "For some odd reason, I wasn't as frightened, I thought we would be OK, I thought we could get out of it," Charles said. "My wife says I'm thick as a brick, so you know, she figures, 'You're not smart enough to know you're in trouble.'" The two parked their rental car and were able to get a ride from two people on a passing boat. The next day, they realized their rental car was burned beyond recognition. "When you see the tape, and the fear, and the reality of what could have happened, it kind of hits home more now," Charles said. "Now I realize we were in a real mess."